Nevada -- a gambler's paradise where shotgun weddings run rampant and brothels are legal in half the state -- has added yet another unique attraction under its belt: autonomous vehicles. Nevada is the first state to issue driverless vehicle licenses on public roadways and the first state to officially welcome such vehicles, although existing in rules in some states haven't seemed to explicitly prohibit automated vessels. Although Nevada appears to be the most zealous state in terms of embracing cars without drivers, there are a number of restrictions which will keep a human (possibly two) in those cars at all times. Just a couple of months ago, the state was the first in the U.S. to pass a set of regulations for the operation of autonomous vehicles. Those regulations seem to spell out the need for two people inside the vehicle -- one person to take manual control when necessary and another person to monitor the course plotted by the computer system. The state DMV will be issuing special license plates for driverless vehicles. The red-colored plates will prominently display an infinity symbol on the left side -- a curious choice of graphical identifiers and certainly difficult to explain outside of Google's influence. "I feel using the infinity symbol was the best way to represent the 'car of the future'," DMV Director Bruce Breslow explained. 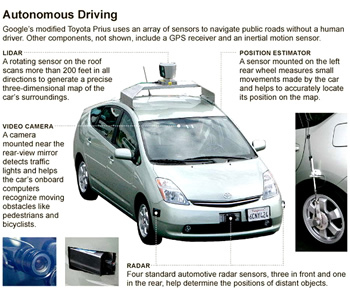 The first fully-licensed, autonomous vehicle to hit the roads will be a Googled-up Toyota Prius. DMV officials have already had the privilege of being chauffeured by the LIDAR-dependent driving system. Although many may think "Google" when talking about driverless cars, it is interesting to note that other companies have applied for autonomous vehicle licenses as well. "The DMV says other companies have indicated their desire to test and develop autonomous technology." claims the Las Vegas Sun. Other sources have indicated that those "other" companies may be BMW, Volkswagen and Audi.